Whenever I look at the calendar on my wall, I always find myself shocked that it’s already August. Summer is nearly over, and for most of my friends (and my younger brother), school is starting in a matter of days. Not weeks or months—days. It sure has been a while. Since I’ve last posted, a lot has been going on in my family (more information on my personal blog), and it’s been an important reminder of the importance of family. Partially because I’m only half Filipino and partially because I live in the United States, I’ve always felt disconnected from my Filipino heritage even though it shapes a large part of who I am. 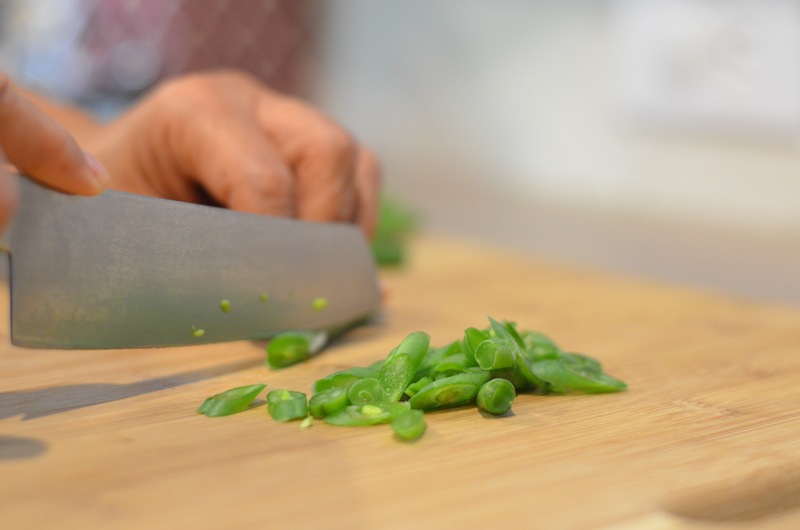 That’s why I find it so important for me to continue trying new Filipino food, learning how to make certain recipes, and keeping these recipes documented somewhere. At the end of the day, even small recipes like these are a part of what makes up my family—a part of the heritage and traditions passed down through my mother’s side. 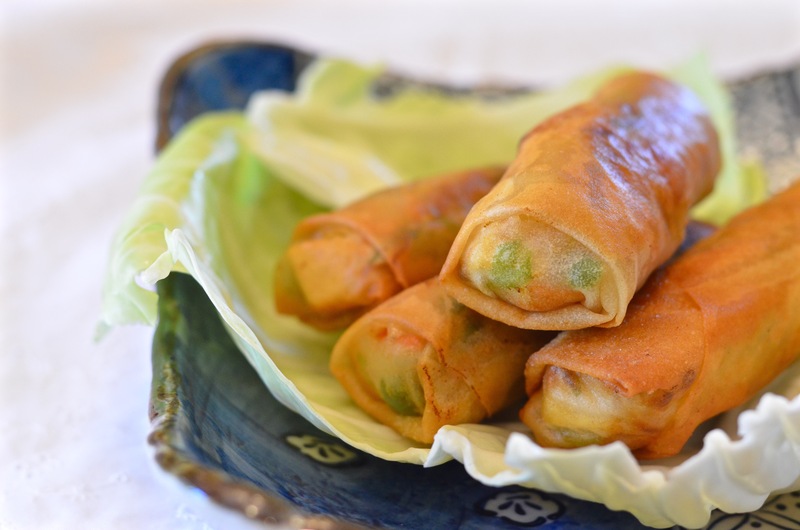 My mom first introduced lumpiang gulay to me while I was in middle school, and when we decided to not eat meat for a period of time, it made for a great meal that fit our dietary preferences at the time. Even though I still do eat meat (although I may go vegetarian again once I leave for college next year), lumpiang gulay is still something we continue to eat in my home. 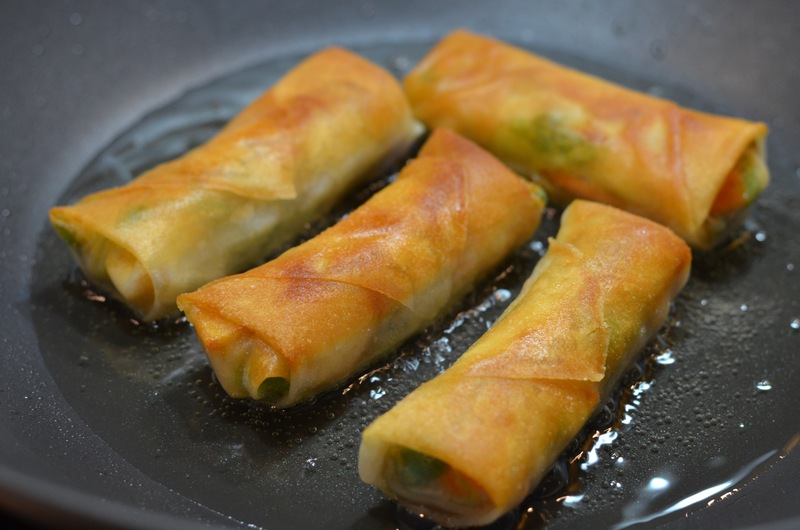 Now that my grandma from the Philippines has been in town, I’ve also realized that she and my mom have very different ways of eating lumpiang gulay, a huge shock to me since I always assumed the way my mom ate it was the normal way. 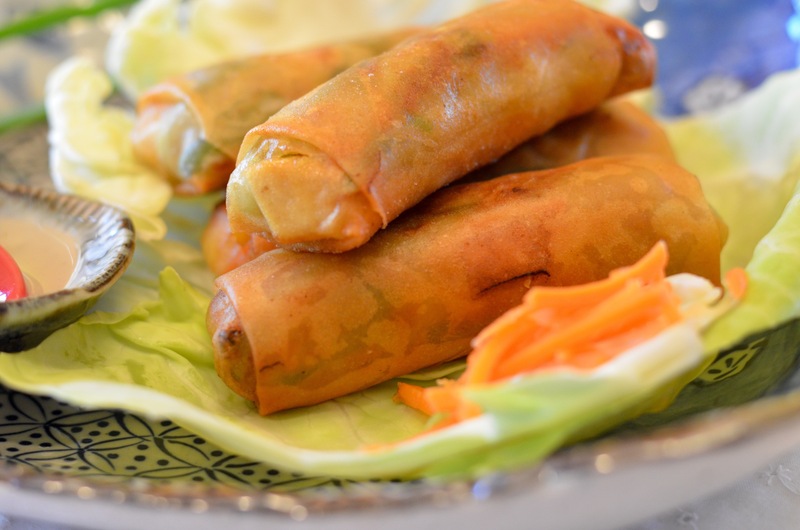 My mom likes to cut into the lumpia lengthwise and pour in the garlic sauce that way, whereas my grandma eats it the “normal” way—dipping it into the sauce and eating it like any other spring roll. I personally think the way my grandma eats it makes way more sense, but for some reason my mom continues to eat it the way she does. Turon is one of the easiest, most delicious little desserts I’ve ever had. What’s turon, you ask? 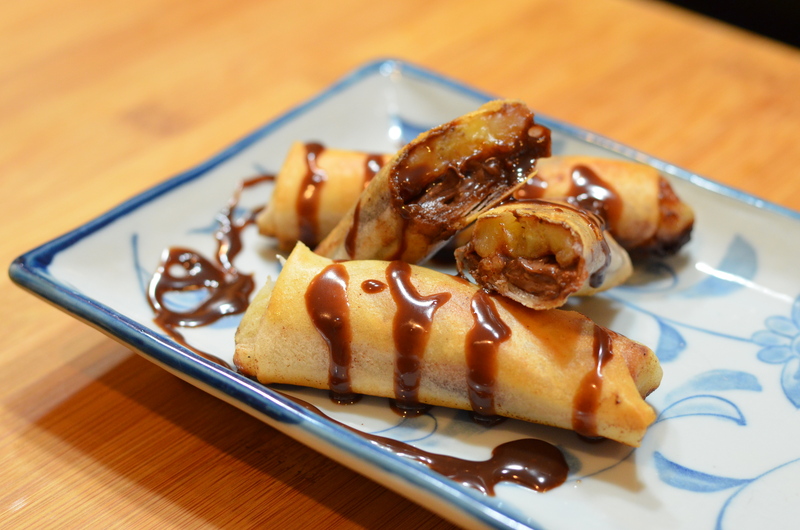 It’s a Filipino snack made of saging (banana), langka (jackfruit), and brown sugar rolled in spring roll wrappers and fried. Here in Dallas, it’s not exactly easy to get the jackfruit—or even the same bananas!—to make the truly authentic turon, which left my mom and I to experiment. My mom first showed me what turon was not too long ago… maybe a year? (Then again, I could’ve been eating turon all my life and just never knew the name of it, so I can’t be sure.) I was taken aback by the delicious, sweet taste of the saging and langka and I just. Wanted. More. Turon is one of my favorite desserts, behind macarons (which I have an obsession for). The sad part is I can’t have it all the time because you just can’t get the same type of bananas here in Dallas… and I can’t find that really good jackfruit! So when you can’t make it authentically, you just have to experiment. My mom called for me one morning yelling, “Josh! Josh! I have this great idea for the blog!” By now, I’m so used to her calling for me with some recipe she wants to make, and half of them don’t make it past that initial “I have a great idea!” phase. My eyes lit up. Really? Turon? Let’s do it! And that’s how our turon recipe got pushed to the front of our list—above everything else we’d been planning. Making turon is actually really fun. 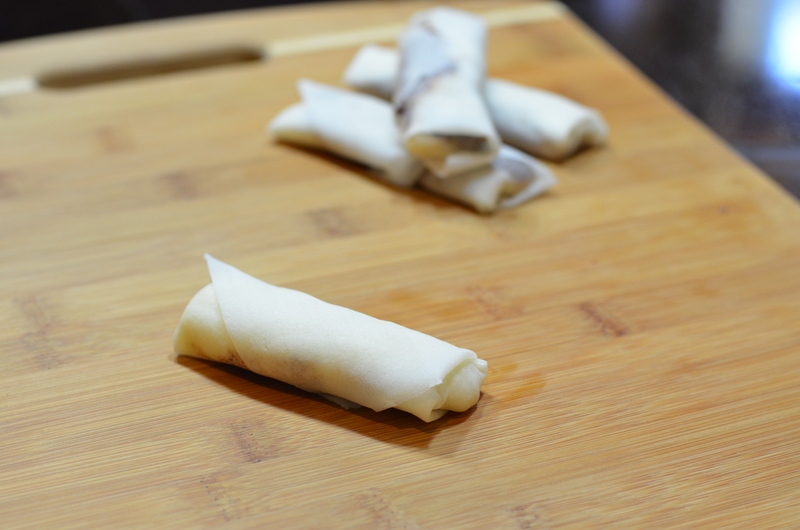 I rolled a few of the turon, and it’s actually really easy. 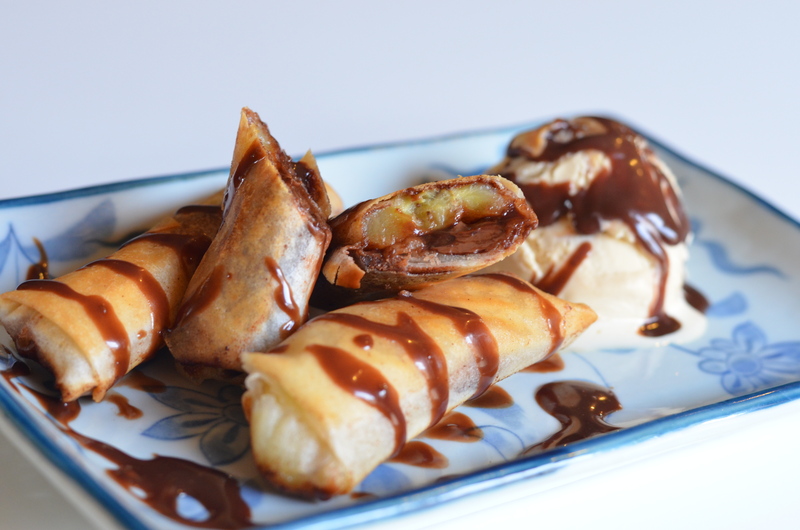 Just make sure you wrap the banana and nutella in the spring roll wrapper very tightly, or it’ll look really bad and won’t hold together very well. Also, a little something I learned is that if the wrapper itself is not sticking together and becoming a roll, then just dab a little water on it, and the wrapper will stick to that. Here’s a little step-by-step on how to wrap the turon. Have fun with this turon. If you’re skeptical, just remember that this one has Nutella. And it’s a well-known scientific fact that Nutella descended from heaven into Italy in the mid-twentieth century. By virtue of having Nutella in this recipe, it’s instantly good. Makes one individual turon. Obviously you’ll want a LOT more so just multiply this by the number of turon you want to make. One million is a good starting number. Place 1/4 of a banana on top of a spring roll wrapper. Then sprinkle a little cinnamon on the banana slice. 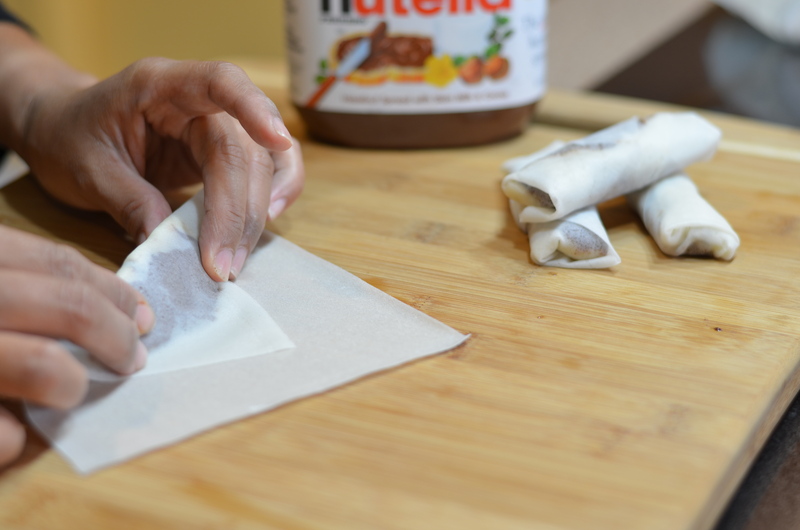 Spread Nutella on the banana slice, and begin rolling the turon. 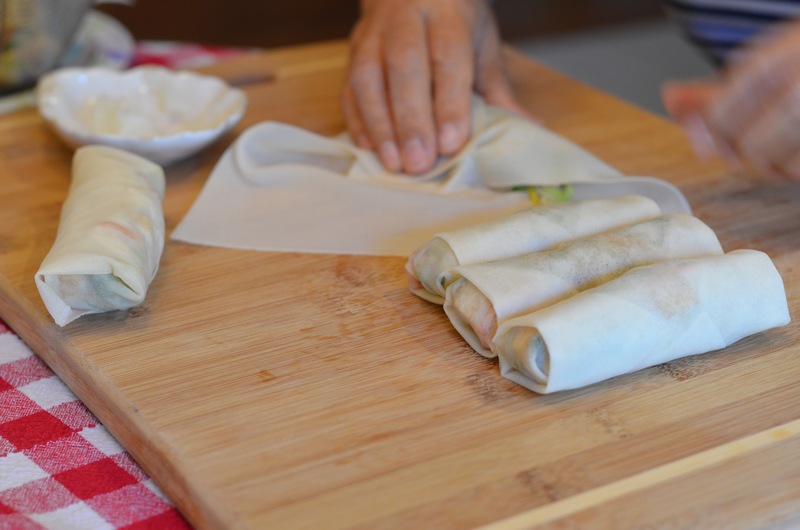 (See the above slideshow for step-by-step instructions on how to roll the turon.) 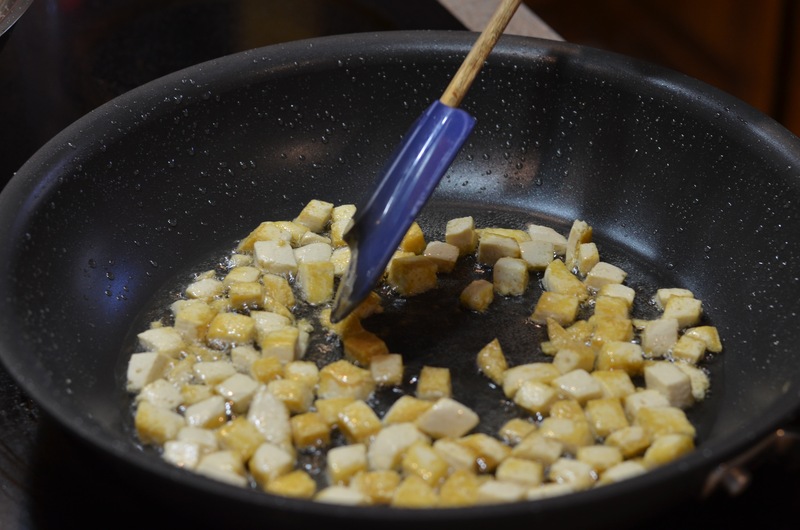 Add oil in a small pan and put over heat. 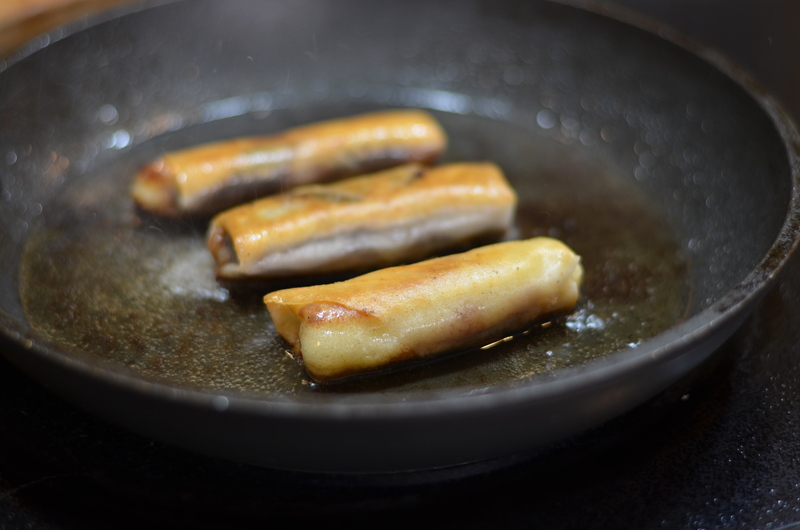 When hot, fry the turon until browned on both sides. Serve with your choice of dessert—we used a dulce de leche ice cream with a Nutella drizzle. 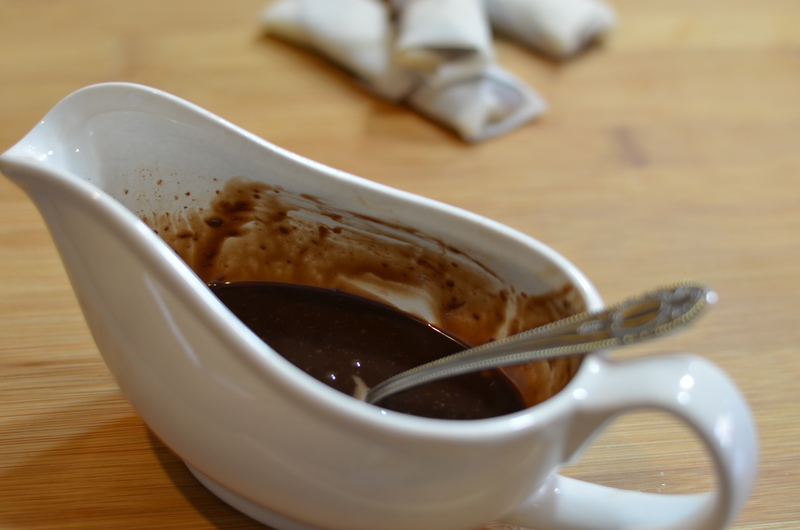 Add 2 tablespoons of Nutella and 2 tablespoons of whipping cream in a small, microwave-safe bowl. Microwave for 30 seconds, then mix well. 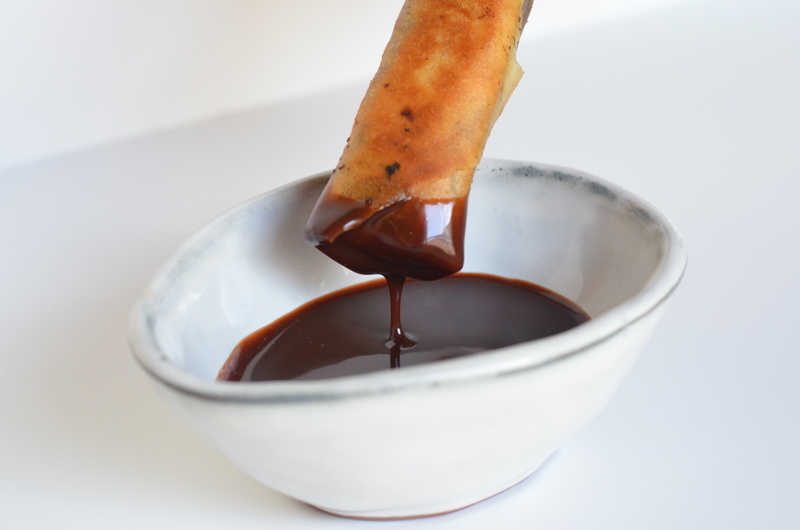 Lightly drizzle over the turon (and possibly other desserts!) for maximum deliciousness. I'm Josh, a Filipino-American student from Dallas exploring the world and all it has to offer one picture and one post at a time. Enter your email address to follow Bok Choy and Broccoli and receive new posts by email.